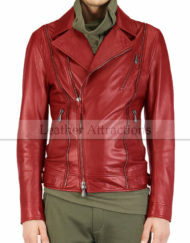 Sleek biker leather jacket is another marvelous piece of clothing from our collection of designer's leather products, that have been crafted with the combination of hand-selected finest natural sheep skins & our highly industrious craftsmanship. 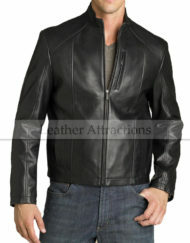 The horizontal, contrast-color stripes at its front extends all the way to its sleeves, contouring this black motorcycle leather jacket in great style. Front zip fastening with horizontal contrast-color stripes at chest and sleeves for contemporary looks. Stand collar design with snap tab. 2 inner pockets so your on the go essentials are easy to reach, with 1 cell phone compartment. Approximately 25″ default length for “L” size.